The 80 milligram bag of carfentanil the Houston Police Department seized on June 7, 2017. By now you’ve likely heard of fentanyl, one of the narcotics at the center of the nation’s opioid crisis. But now, authorities in Houston are issuing an urgent warning that goes beyond the narrative of addiction. Officials have found a powerful analogue of fentanyl, carfentanil, a drug so powerful that mere skin contact can lead to lethal exposure. 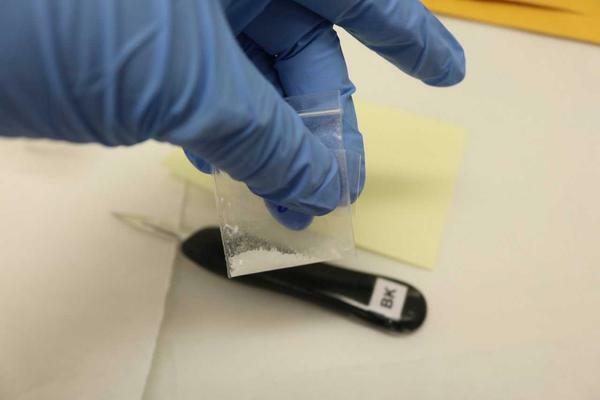 Houston Police Chief Art Acevedo, Mayor Sylvester Turner and Drug Enforcement Agency agents held a news conference Tuesday about the carfentanil discovery, and they were joined by Peter Stout, the CEO of the Houston Forensic Science Center. Stout says that in early June, the Houston Police Department (HPD) brought 80 milligrams of a substance presumed to be methamphetamine to the center. Tests revealed that white crystalline powder was actually carfentanil. “No one really knows what the lethal dose of carfentanil is in humans, but it’s estimated that the lethal dose is about 20 micrograms, which means that pack of 80 milligrams is about 4,000 lethal doses,” Stout says. He says that 80 milligrams is the size of a fraction of a packet of sugar. Carfentanil is manufactured in China, and is either shipped directly to the U.S. or comes through Mexico. “As people are counterfeiting illegal drugs – heroin, illicitly produced Xanax and Vicodin and all of these other things – they’re using fentanyl drugs as a substitute for other opiates because it’s cheap and it’s highly potent and they can put it in there and make a lot of money,” Stout says. The Houston Forensic Science Center is working with HPD to train officers on how to protect themselves from these substances. HPD is also working to get better protection equipment including gloves and masks and ensure that officers have access to Narcan (naloxone), a medication that blocks the effects of opioids and reverses an overdose. Stout says that Narcan is available with or without a prescription at any Walgreens in the state and that it costs roughly $30. “If it’s not for your own protection, you might be able to save a life of somebody who has overdosed,” Stout says. Faced with a rising death toll from opioid abuse, Texas public health officials in May decided to apply for a $1 million federal grant to purchase Naloxone, a drug that, if administered during an overdose, can save the life of a person addicted to heroin or pain pills. Update, Oct. 12: The Drug Enforcement Administration (DEA) is withdrawing its intent to classify Kratom, a leaf indigenous to Southeast Asia, as a Schedule 1 drug and opening a public comment period to last until Dec. 1.